The last week has been very productive due to having several days off work and no school either. Our daily routine has been - get up, eat breakfast, stitch/play, build Lego, eat, stitch/play, build Lego, eat, read blogs, bath child, read story, stitch, read blogs, sleep. BLISS! I won this chart from Shirlee, the Hilarious Easily Influenced Stitcher. It arrived on 18th December, I ordered the fabric, satin thread and charms on the 19th, they arrived on the 21st, I started stitching on the 22nd and finished on the 2nd January. I used all DMC but did get the DMC satin for the baubles which is a PITA to stitch with but looks great. It would have been easier if I'd needed 2 strands because I use the secured needle method of stitching so less slippage but for coverage, three strands were needed. I used a Just Buttons cardinal instead of the Mill Hill bird (cheaper and nicer) but as it was slightly bigger I used it on the top garland instead of the round wreath, which now has the red star. The variegated threads worked well on this. The green is DMC 92 and the red 115 (of course!). I do enjoy having a seasonal stitch to work on over Christmas and this was a lovely one. The fabric is 28 count platinum linen and has distorted a little due to the satin stitching in the words so I think I'll get it professionally stretched and framed. I got a framing voucher for Christmas so that's ok! I usually go for the more subtle plain frames but at Christmas I do like a bit of grandness! This design came from Cross Stitch Collection Christmas 1995 and has been on display every year since then. My next finish was the Needlecraft Haven October Freebie Challenge. Each month Christine chooses us a different freebie to stitch within the month. As I was still stitching Hallowe'en designs I missed that month and thought I'd catch up actually during Christmas. Stitched over 1 on 28count evenweave. I'm not a fan of stitching long straight borders so I changed the white border into a backstitched lace effect instead. I really enjoyed stitching this design, more than I initially thought I would. Stitching over 1 made all the difference for me, it's just so sweet and delicate! Christine really does have great taste in choosing these designs for us each month. The fabric is 28 count white sparkly evenweave and the backing is a piece of ribbon stitched onto some navy 14count aida for ease of finishing and to make the design stand out more. I'm planning to get a little snowflake charm to attach before I stitch it together. Nice and simple, a silver holly border to cover the edges! I also added a little cartouche in the gap after I'd taken the photograph, it says Ho Ho Ho! This was a giveaway from Kaye of Kitten Stitching and one of my resolutions is to try stitch gifted designs sooner rather than later! I've won several gorgeous designs over the last year and feel a little guilty that they sit in bags not being stitched. So this was one, Shirlee's another and there are more on my "13 in '13" list. Finally I had a lovely surprise at the end of December. My sub's copy of World of Cross Stitching arrived and as I browsed through it I spotted a rather familiar sight (or site), my blog on the Blogger of the Month spot!! 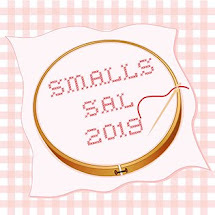 Apparently I offer "amazing SALs" as well as "stitchy gossip", is that like bitchy gossip only about my fellow stitchers? LOL. Anyway I'm really chuffed to be chosen for this spot, so Thank You WOCS. 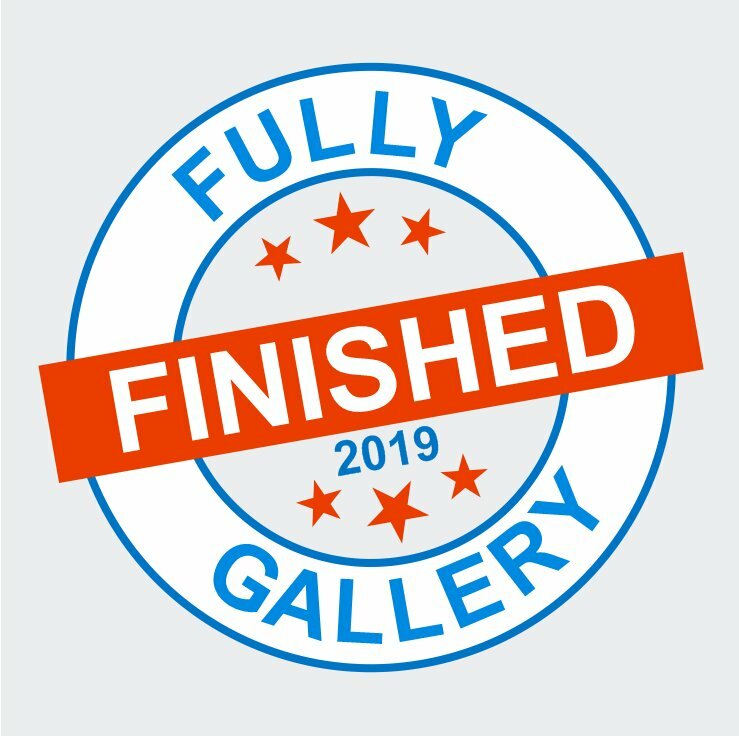 All beautiful finishes and well done on so many already. Congratulations on the blogger of the month a wonderful achievement indeed! Lovely finishes Jo! You really started off the New Year with a bang! Congratulations Jo! It looks like you are leaving the rest of us in the dust with what you have finished already this year! You have been a BUSY girl! Love that the magazine chose you!! How fun.I still have hope for WOCS showing up here...LOL, I am faithfully stalking the places that normally sell it here. Lotas of lovely stitcing. Aren't holidays great, back to the grind on Monday. Way to go! 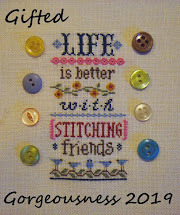 And a great way to start you Stitching New Year. You really accomplished tons during your break - great job!! Really lovely finishes! Congrats on your blog award. That's a great way to start of the new year. In between Legos, stories, playtime, baths and eating, how ever did you manage to stitch all of these wonderful designs, Jo? They are all wonderful! Congratulations on the World of Cross Stitching award too! 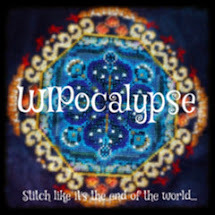 You really do have a great stitching blog! Lovely finishes Jo! Wishing you and your family a happy 2013! I love the Joyous Noel one Jo. Yep those satinny threads are a complete pig to work with, but they look so pretty when they are done. The red fabric on the monthly challenge is really effective, it is such fun seeing how differently everyone's finishes come out each month. Well done on being blog of the month! A well deserved shout out in WOCS!! Congratulations. VERY pretty finishes! I hadn't seen the "Joyous Noel" pattern before and really like it - another addition to the wish list. Congrats on all the gorgeous finishes Jo. They are all so pretty. And, congratulations on being in the WOCS magazine. I really do need to subscribe to that one. EVERYTHING looks fantastic! I especially like the Alphabet Cat and the backing you chose. I'll have to check out your Blogger of the Month, that's awesome! All so pretty :) Congrats!! Beautiful finishes, I especially love Noel ornament! Congrats, I must check out this issue of WOCS! Great start of the years, already three finishes!! You have achieved so much. Well done Jo. Great way to start the year. Gorgeous finishes and congratulations on having your blog featured in WOCS. Congrats on being he Blog of the Month. Super finishes, Noel will look stunning in a gold frame. Well done on the finish. Found you on the Turtle Trot SAL, looking forwards to seeing your progress. Good luck! What lovely finishes!!!! Congrats on having your blog listed in a magazine! How cool! Congratulations on the finishes! Joyous Noel is my fave but I LOVE the ribbon backing for the cat!